In the wide shop window of Caravanserail on Cheshire St sit a pair of plush winged armchairs, facing one another over a dimpled copper table as if in silent dialogue. 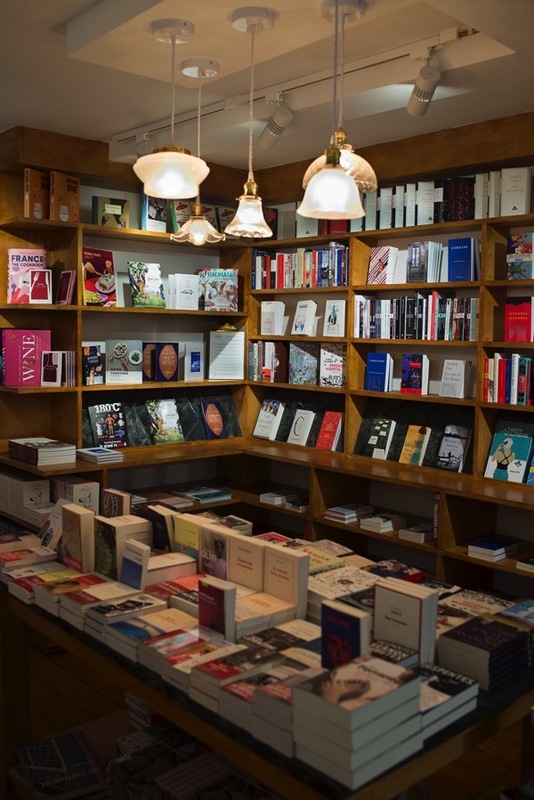 It is a beguiling scene, and I enter to find an elegant new French and English bookshop, café and gallery space in the middle of Spitalfields. 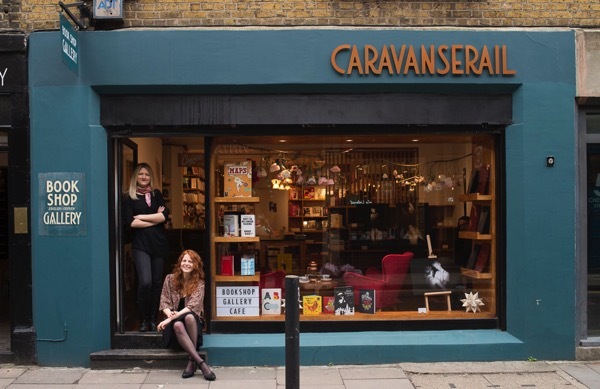 Founded by two French cousins, Anne Vegnaduzzo and Laura Cleary, Caravanserail offers a rendezvous for French and English books, art exhibitions, poetry readings, music and translation events in one space. The name evokes hostelries where travellers and merchants stopped by for the night on their journeys. “It’s more home than shop,” says Anne, when I remark upon the cosy atmosphere. Behind the counter I spy a set of Hornsea tea and coffee caddies, like the ones we had at home when I was growing up. There are croissants and copper cafetieres, and tea served in blue and white china tea cups for book browsers in search of sustenance. 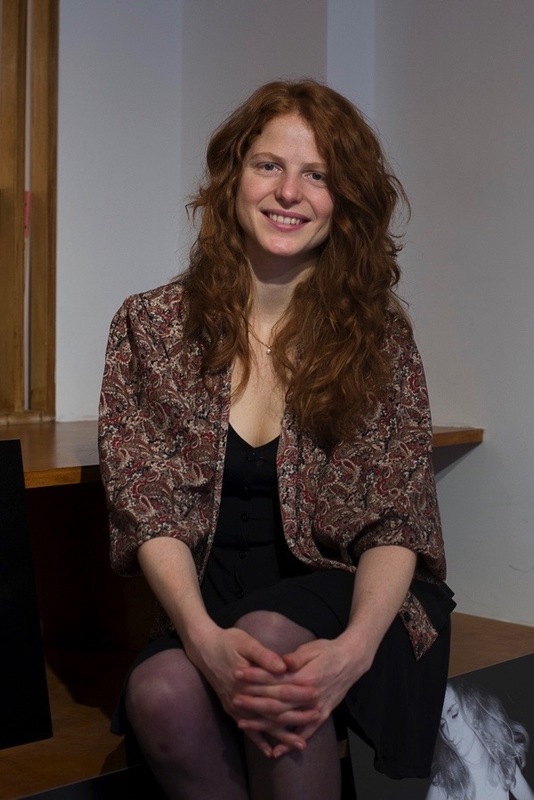 When Laura moved to London in 2015, she felt it was the perfect hub for what they both had in mind, offering a diverse cultural mix in a city that is favourable to start ups and small businesses. The project began incubating during the run up to the Brexit referendum in June 2016. The result did not deter them, they insist. In December 2016, they decided they wanted to open a book shop together. It was just six months after the referendum, with much talk of a downturn in the economy and a feared exodus of French and other EU nationals. Were they nervous about opening a business at that moment? They began looking around for a place in the East End, attracted by the cultural dynamism of an area with a long history of migration. 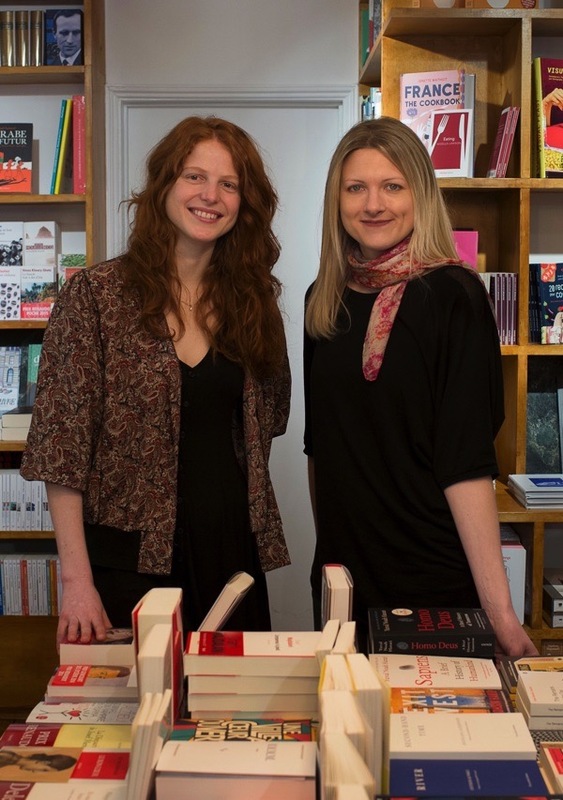 Like the French Huguenots before them, Laura and Anne are part of a wave of French arrivals in London, a younger crowd who escape the pull of the Lycees in South Kensington and Kentish Town into Bethnal Green, Haggerston, and Spitalfields. Laura felt at once that this was the one. It was a Saturday, and Anne was in Paris. The cousins had to make a quick decision – the landlord wanted a deposit by Monday. The shop was run down, dark and dingy and neon lit, with a low ceiling, but it was the wide window that convinced them. They imagined the vista of books and art from the street into the shop, the snug for people to sit by the window, sipping coffee and browsing through a book. That was the coup de foudre moment. The next challenge was how to transform the dilapidated shop into the hybrid platform they had in mind. They drummed up the services of an architect friend in Paris, and within a week or so, he had produced a set of drawings. “We wanted to have a space where people can hang out, a bookshop and a gallery, and a space for events,” Laura says. Six months later, give or take a few snags, they had it: tawny wooden floors and book shelving, white walls with exposed copper piping snaking around the ceiling, and pockets of bright, warm light. They opened the shop in July 2017, just over a year after the referendum, and have not looked back. On offer there are book titles in French and English, and international literature translated into English. Laura explains that a big difference between the United Kingdom and France is that there is little translated fiction. 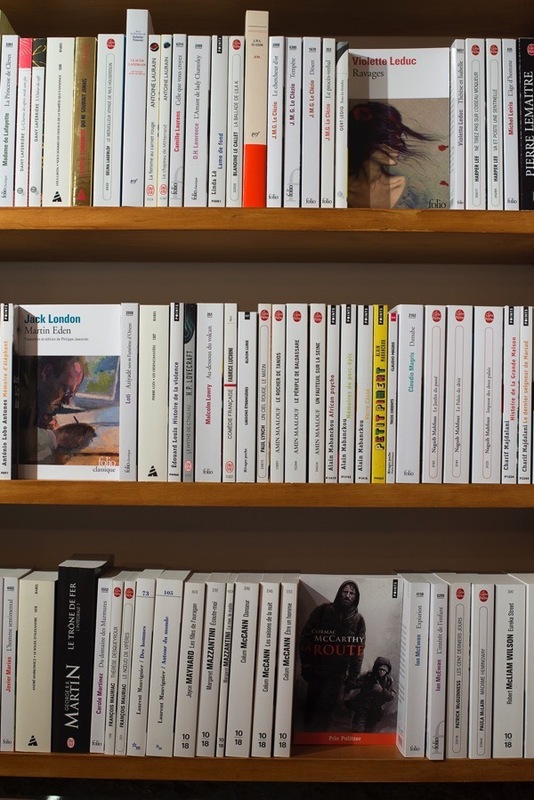 Around five per cent of fiction sales here last year came from books in translation, while in France it is closer to fifty per cent. In addition to literature, there are art books, graphic novels and a dedicated section of children’s books, in both languages. Contemporary art photography is displayed on the walls and the shelving that doubles as a seating area for music, art and literary events in the evenings. First Tuesdays of the month are for spoken word events in collaboration with BoxedIn. More recently, they have introduced a monthly evening on the art of translation, and there are jazz and poetry evenings, and book events for children. On the day I visit, I am shopping for the birthday of an old friend who is half French. 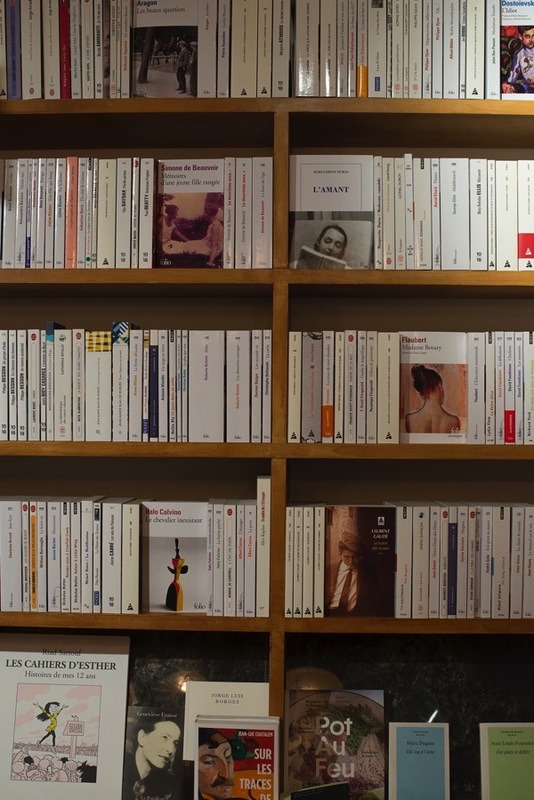 There is a wall of the striking white-spined novels so prominent in classic French bookshops – Madame Bovary is turned out to face me. I cannot quite decide, and select Albert Camus’ L’Etranger for my teenage daughter, who’s studying French A level. Then I notice a select supply of stationery that is hard to resist, and I choose two birthday cards, designed by Letter Press de Paris. I scan titles in translation and in the original French by authors such as Leila Slimani, whose bestseller, Lullaby, is displayed prominently, and Muriel Barbery’s The Elegance of the Hedgehog. There is the eye-catching graphic novel by Hamid Sulaiman, Freedom Hospital, A Syrian Story. I’m spoilt for choice, but eventually I pick a book on 25 contemporary French artists, and also Lauren Binet’s latest novel in English, The Seventh Function of Language, described by one reviewer as a post-modern hybrid of other texts. It feels right for my half-French, West London dwelling friend. Caravanserail, 5 Cheshire St, E2 6ED – open Tuesdays to Sundays. 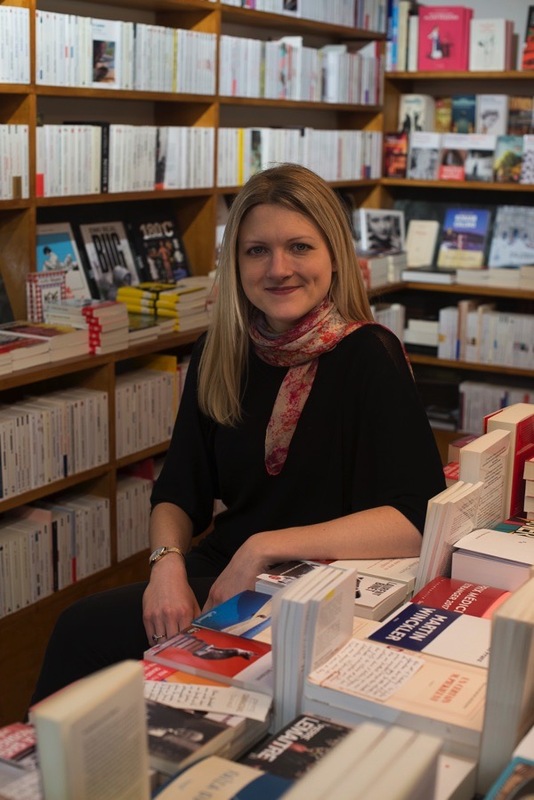 Rosie Dastgir’s novel, Une Petite Fortune, is published by Editions Bourgois in France and Quercus in the UK. Well done, Ladies! An elegant riposte to the creeping Little-Englandry that’s blighting Blighty these days. A very attractive looking bookshop, I wish them every success. Good luck to these two French ladies! I wish them every success with their bookshop, if I am every in the locality I will visit. Congratulations. It is always heartening to see a new bookshop. I wish you every success. How fabulous! Can’t wait to get there.